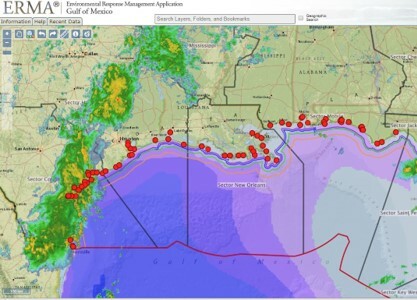 The ERMA online mapping tool shows both static and real-time data, such as ship locations, weather, and ocean currents, in an easy-to-use format. Spatial data describe the location and shapes of environmental features as well as events occurring in the environment, such as an oil spill into an estuary. Analyzing this information is crucial in responding to, assessing, and restoring damage to marine and coastal environments. Assessing important spatial information and designing successful restoration projects rely upon interpreting and mapping geographic information, including the location, duration, and impacts from oil spills, other hazardous materials, or debris released into the environment. Data Integration, Visualization, Exploration, and Reporting (DIVER) - Search this online data warehouse to view the information collected to document the location and extent of injuries to the environment as part of natural resource damage assessment efforts. We use this data to determine impacts from an incident, and samples may be taken from air, water, sediment, oil, even tissue from wildlife. Field teams may also record environmental conditions (e.g., water temperature, salinity, and oxygen levels) and visual observations (e.g., vegetation density, and wildlife counts, indicators of wildlife heath). Aids in spill preparedness and planning. Assists in coordinating emergency response efforts and situational awareness for human and natural disasters. Supports the Natural Resource Damage Assessment process. The NOAA Restoration Center interactive Restoration Atlas will help you find habitat restoration projects near you—search for projects by habitat type, location, or congressional district.